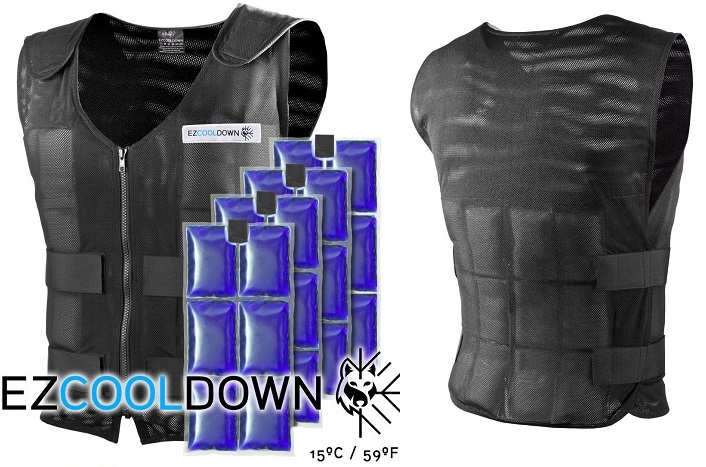 The EZCooldown Performers vest is specially designed for actors, cosplayers, LARPers, fursuiters, and other costume performers. This cooling vest provides hours of cooling comfort and prevention against heat stress thanks to four special PCM inserts which provide comfortable cooling relief for up to four hours, even during strenuous activities in high-temperature environments. The EZCooldown Performers vest is made out of thin yet durable polyester mesh which won’t add a thermal insulating layer to your outfit. The four inside pockets can house four PCM inserts: two on your chest and two on your lower back. Changing the inserts for a set of fresh ones can be done in minutes. So while you are wearing one set you can keep a second set in your refrigerator or freezer or a bucket of ice water. This way you can stay cool forever! You can also store activated sets in a cooler or insulated bag. They’ll stay cold for up to 12 hours. Our vests come in three sizes and can be easily adjusted with the six Velcro straps to fit each individual wearer perfectly. This snug fit makes the vest virtually invisible under costumes, adding only 2 3/16” of chest circumference when using the six-cell inserts and 2 1/2” when using the four-cell inserts.